My boys are both allergic to nuts. My oldest is only allergic to peanuts, but my youngest is allergic to all types of nuts. 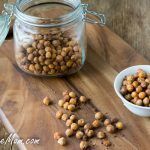 I was ecstatic the day I found that garbanzo beans could be baked and made into a crunchy snack for my boys. I found a recipe in a magazine called Cookie(Dec.08 issue). I switched out the sugar in the recipe and changed the oil used and tried it out. 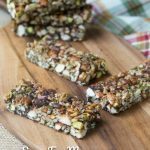 Whether you have children allergic to nuts or not, these are a great healthy snack for everyone. 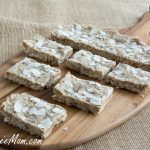 Very low in calorie, crunchy, nutritious and delicious! Easy to take anywhere and stores just fine in an airtight container. 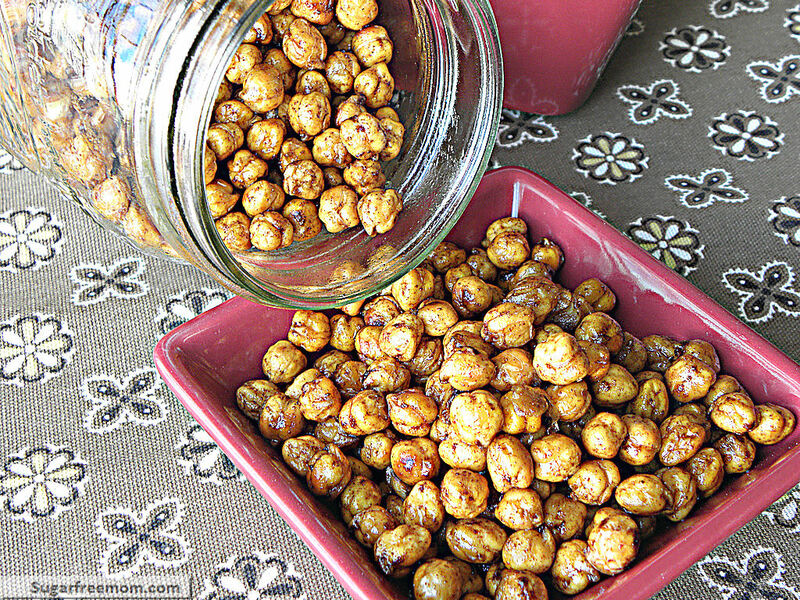 If you’d rather use canned chickpeas, you can try my Garlic Parmesan Chickpea recipe! ** If you don’t want to soak beans overnight you can just use canned beans. Drain and rinse and let dry for 30 minutes before following the rest of the recipe. Soak dry beans overnight in cool water. Drain, pat dry with paper towels. In a bowl, toss the beans with oil, cinnamon and 1 tbsp sucanat and 1 tsp salt. Spray a baking sheet with cooking spray and spread beans in a single layer on sheet. Roast them in oven until crunchy and no longer soft in center, 45 minutes to an hour, stir them a few times to prevent burning. Transfer the beans back to a bowl and toss with 1/2 tsp salt and 1 more tbsp of sucanat. Ww, thanks for catching that for me! I actually have it correct on my other posts when I’ve mentioned but I am so grateful you caught it on this post! Thanks so much! These sound great! It should work with other flavors too, shouldn’t it? I’m thinking something savory or spicy. Yum!! Just curious, why can’t canned chickpeas be used? 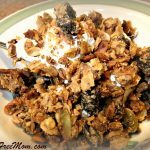 Well this recipe was before I tried them with canned LOL! So yes they can be used, just rinse then dry them on paper towels for about 30 minutes. I just made these and I used 2 cups dried beans and it only came out to about three cups when they were done…. ? Did you cook your beans before making these or just soak them like it says above? I coked mine for less than an hour and many of the beans are so hard that they are difficult to eat! I can’t feed these to my kids for fear of them breaking a tooth! I will try again sometime and cook less or start with cooked beans so they start off soft. I love the idea and they make my house smell amazing with the cinnamon! I haven’t made this in a while. I will remake it over the weekend and let you know. I may have made an error in how much I got when cooked. I did not cook them, only soaked them and cooked them as it says. I will let you know. I like the really crunchy ones, but you might prefer cooking them less. Hi Ashley, I just made them and adjusted everything. The cup only doubles to 2 cups so I also had to fix all the nutrition info as well. Thank you! Is there anything that I can substitute for the sucanat? I’ve never heard of it before and not sure what it is. yes, you can replace it with brown sugar. Thank you so much!! I just made a batch of the garlic parmesan ones but alot of them burnt at like 35 minutes while the others were not crispy at all, did I do something wrong? The chickpeas on the outere edges of the baking pan will get more crunchy then the ones in the center. So I would suggest turning them around after 15 minutes and then again at 30 minutes. But often there is no way of getting them all cooked evenly, just the nature of baking chickpeas. Thank you. Even though some burnt, we(me and all 3 of my kids) ate every last one! Can’t wait to make the sweet ones too. Thanks for these recipes, I love chickpeas but my kids have never liked them before today! 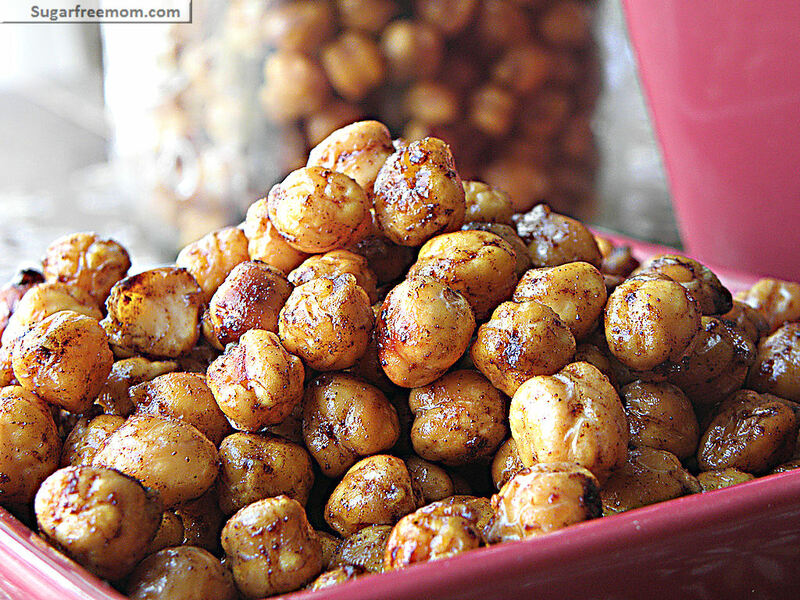 Oh I wish I had seen this recipe for roasted sweet chick peas. I just made my first today. I wondered if they would be good sweet. I uses coconut oil and season salt. I have never tried a chick pea until today. Not bad. I also made my first hummus. I also used coconut oil in it. I can’t wait for my hubby to get home and see how he likes them both. I cooked a pack of dried peas in the pressure cooker. I did not soak them. They were ready in about 30 minutes. I’ve baked chickpeas before and I find they get crisp w/o burning when I use a baking stone. The problem with the pizza stone is that these little morsels act as popped corn when the oven door opens and exposes them to air…Soon the kitchen wreaks of burned beans on the oven floor. ;+) It’s best to use a high-sided pan for best results. 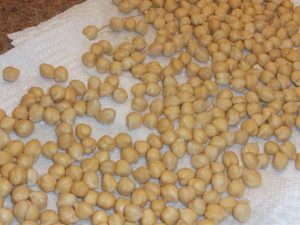 I have been making batches of these beans for a couple of days, and I’m still looking for a two-thumbs-up recipe. 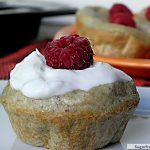 I can’t wait to try Sugar Free Mom’s recipes in a few days; and will leave an update. I read that you can use sugar free syrup for pancakes and mix it with Stevia to get brown sugar – I saw it on Pinterest… I wonder if thats an option? 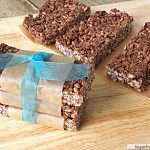 My husband is a diabetic and LOVES sweets, so i have to be so careful…. I haven’t seen that, but I wouldn’t use any sf syrups that contain splenda. Why would you not use the sugar free syrups with splenda in it ? I haven’t tried your recipe yet I’m not a fan of chickpeas but I’m willing to try them again with these recipe . Looks yummy, thanks. I’m soaking these overnight tonight as directed but I plan to eat these tomorrow NIGHT. I’d like to eat them fresh out of the oven but that would mean also soaking them most of the day tomorrow – will they be OVERsoaked? Please let me know if I should dry them in the morning and let them sit all day or keep letting them soak. Thanks! I’ve done the same thing and let it stay soaking even the next day. But when you get home if you have time let them soak for longer than a half hour. Thanks for responding so quickly!! Did you mean let them DRY longer than half hour, though? I tried your garlic parmesan garbanzo beans and they were great. What can I substitute for sucanat? Thank you i love chick peas and also if you blend cocoa nibs in either bake them or put in fige they are fabulous…oh after after blendingg them alone or with cocoa nibs put them in to like a meat map effect and you can season thit what you like …GREAT FAT BURNING FOOD! I and my daughter are cealic and dairy intolerant ! I am fom Ireland and love to try recipies also can you email me as i have been sugar free but i have under active thyroid gland so put 3 stone on while eating great but i lost it in 6 weeks so love to help you if you wish but you look fabulous ..Please get in touch as need information on things! Thank you fiely something so my daughter not deprived!